Controlled Flight Into Terrain (CFIT): An accident in which an airworthy aircraft, under pilot control, is unintentionally flown into the ground, a mountain, a body of water or an obstacle. In a typical CFIT scenario, the crew is unaware of the impending disaster until too late. Mountains are amazing things. We are drawn to them for their majest, for their beauty, for the challenge in taming their summits - sometimes for no other reason than 'because it's there'. Mountains are strong, unyielding, and unforgiving. This can be particularly devastating to an aircrew that has lost situational awareness. 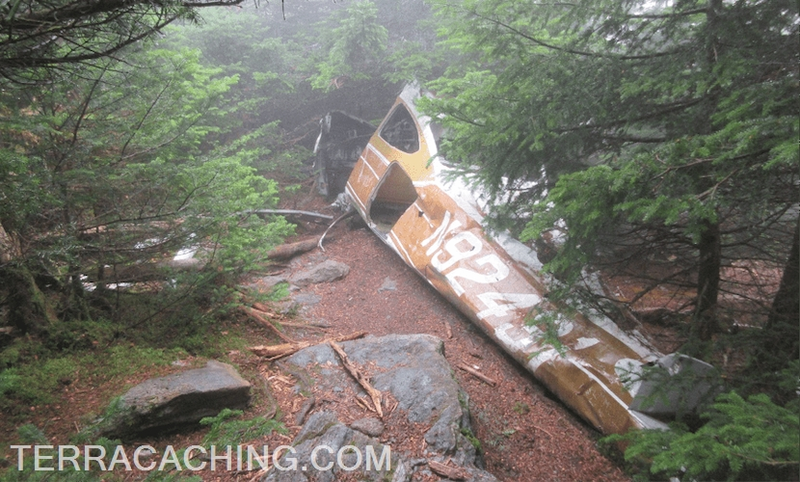 On June 28th, 1973, the pilot of a Cessna 182 was trying to navigate through Lincoln Gap in a cloud bank and struck the northwest slope of Mount Abraham, about fifty feet below the summit of 4,017 feet. The pilot survived the crash. According to local lore, he climbed out of the plane and walked down the mountain. Much of the fuselage structure remains intact with pieces of twisted wing metal scattered about. 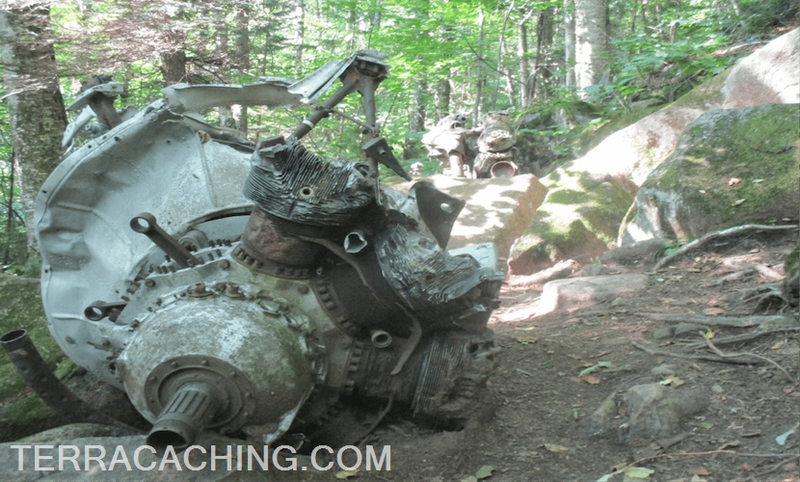 The engine is missing, probably hurled far away into the thick forest. Here, you can search for TC9U3V. 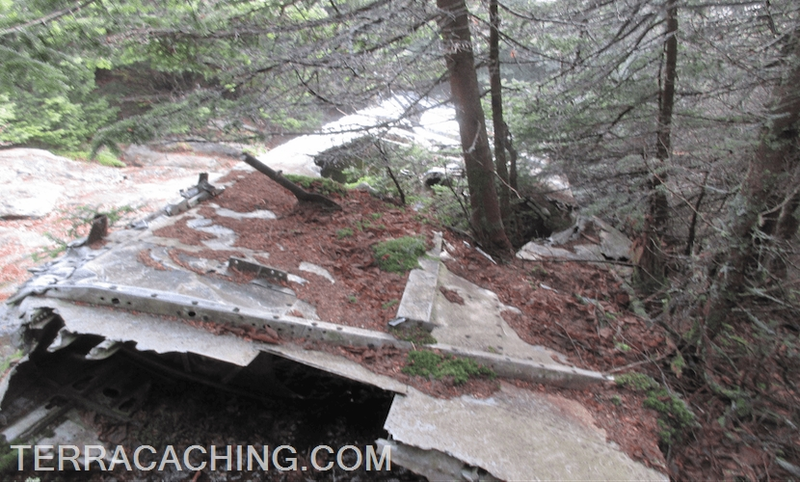 Vermont's third-highest peak was the scene of tragedy back in 1944. 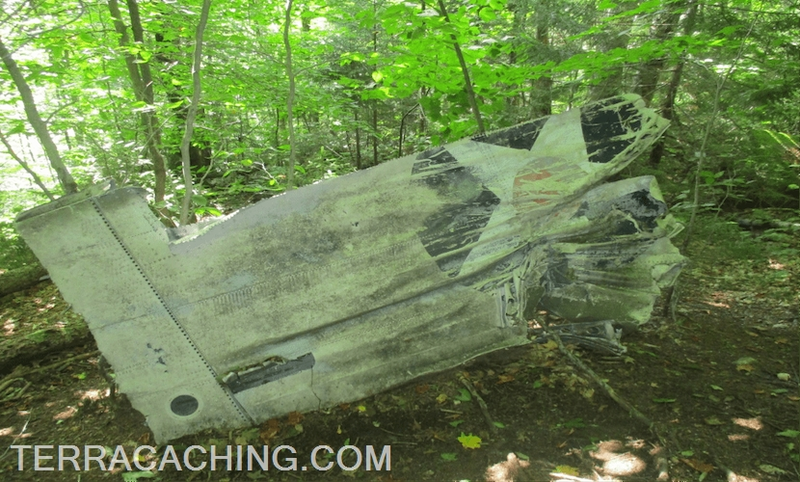 On October 16th of that year, U.S. Army B-24J Liberator (#42-51067) was out on a training mission when it crashed into Camel's Hump Mountain in the darkness of a moonless night, killing nine of the ten crewmembers aboard. The sole survivor, Pvt. Jimmy Wilson, 18, of Jacksonville, Fla., lost both hands and both feet due to frostbite as he lay injured in the wreckage. He was rescued by five teenage members of the Civil Air Patrol, some 41 hours later. Investigators found the wreckage near the top of the 4.083 mountain, the debris field covering more than an acre of land. When we visited, we were only able to find the largest piece- the remains of the right wing, now laying upside down on the slope. Across the path, about ten feet away, TC1IB6 awaits your find! The tale behind this crash had interested us for quite some time. As the story goes, on the evening of January 14, 1942, the tiny villages of Lincoln and Woodstock were alarmed by the sounds of an explosion on the side of Mount Watemomee. That afternoon, a Douglas B18-A bomber with a crew of seven, had taken off from Westover Air Field in Massachusetts to patrol for German U-Boats some 250 miles out over the North Atlantic. Hours later as the plane was returning home in total darkness and worsening weather conditions, the crew miscalculated their position by mistaking the shoreline of Lake Winnipisaukee for the coast south of Boston. At about 7:40pm, the co-pilot, Lt. Woodrow Kantner saw what he first thought were dark clouds. He turned on his landing lights and saw their error. he tried to warn the pilot, Lt. Anthony Benvenuto, to pull up. Benvenuto couldn't hear him and Kantner pulled up. But it was too late and the men could not prevent the disaster. 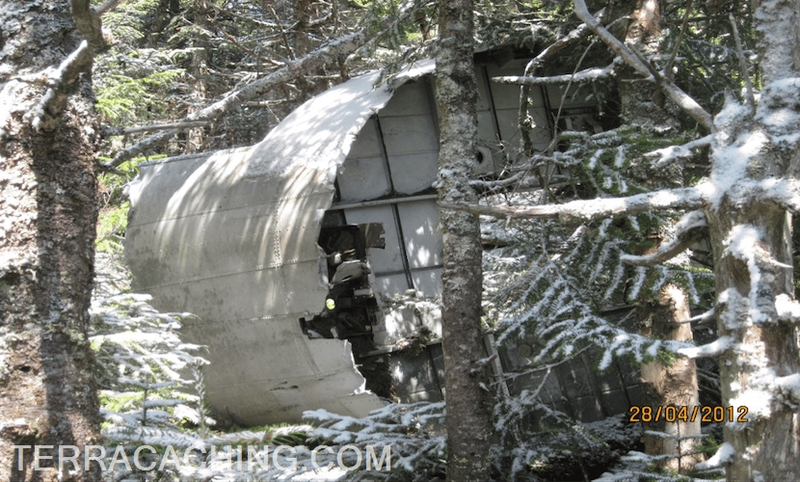 The plane hit a downdraft, stalled, and flew in through trees and crashed in deep snow on the side of the mountain. The five survivors were rescued by local residents including a doctor. A crew of woodsmen had blazed a trail up the side of the mountain, bringing along toboggans to evacuate the inujured. We used our visit to this crash site to log LC7NP - Air Memorial. 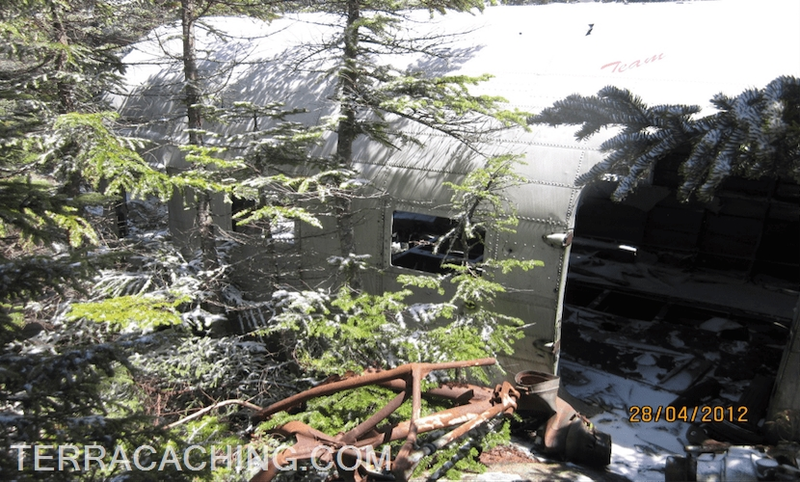 The hike up to Mount Success is reason enough to come here, but just a short distance from the summit lie large portions of a crashed Douglas DC-3. On November 30, 1954, Flight 792 departed from Boston bound for Berlin, New Hampshire with stops at Concord and Laconia, New Hampshire. On board were a crew of four, and three passengers. Just after 11:00 a.m. the flight contacted the air traffic controller at Berlin Airport and requested weather information. The crew was advised that the weather was 3,000 feet overcast, with 2.5 mile visibility, and light snow showers. This was the last contact with the aircraft. On December 2, the wreckage of Flight 792 was spotted rom the air on the southern slope of Mt. Success, 13 miles southeat of Berlin Airport, at an elevation of 3,440 feet. Two members of the crew had been killed, and the captain seriously injured, but the stewardess and the three passengers were relatively unhurt. Located in the remote Mahoosuc Range near the border with Maine, the lower slopes of Mount Success are typical boreal forest of dense spruce and fir intermixed with deciduous trees. 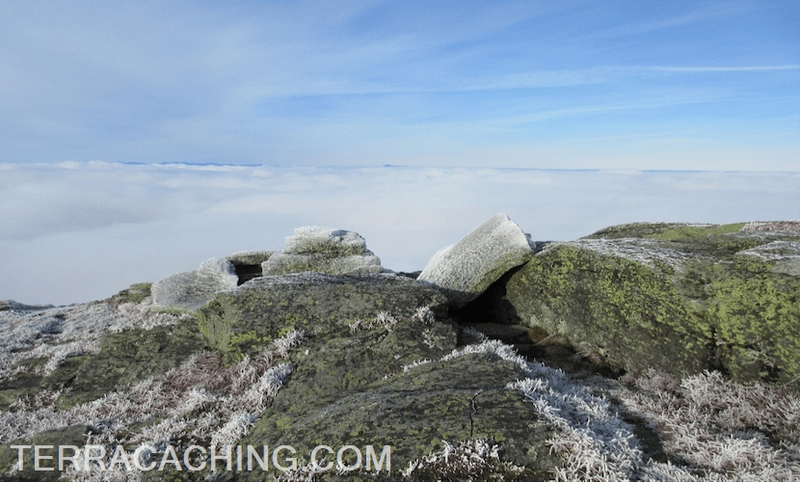 A bare granite outcropping known as The Outlook offers spectacular views into the valley below. Log a photo of yourself inside the wreckage to claim a find on TCHWX. We hope that you have enjoyed the short tour of some of our favorite special places. Whatever your interests or passions may be, there is a whole world of adventure out there to discover. All you need to do to get started is to step outside your door! Get out there and begin your own adventure, for love of the hunt! 1. To help new members understand the site. Sponsors are your official TerraCaching guides; your sponsors should be able to help answer any questions you may have. The Community page is also a great place to get site tips once you have created an account. Someone is always around to help out! 2. To become two of your newest caching buddies. We love the community aspect of the sponsorship system. It allows members to meet each other and get to know a couple of other people who have at least one similar interest! They can also provide support as you learn the preferences of your local community. 3. To support our community based cache approval. Sponsors approve your caches. Sponsors provide information on the different cache types that are available, verify the Cache Detail Page looks correct, and make recommendations on improvements. Generally, members are sponsored by members geographically close to them- together you can build the type of community that appeals to other local members. Once a new member has completed the activation process and logged back into the site, notifications go out to surrounding members. As time goes on, more and more members have the chance to extend an offer. You then get to select from this pool of offers to decide who your sponsors will be. Usually, new members will receive sponsorship within 24-48 hours. It always helps if you post on the Community Page and introduce yourself! Over the summer, smithwitch123 and cash108 got the opportunity to head to the U.S. East Coast for a visit with friends, as well as a chance to find some caches! One awesome thing about TerraCaching and geocaching is the chance to learn something new about your surroundings that you might not have had a chance to learn before. Historical virtual caches are perfect for this! "We were excited to be headed for Annapolis, Maryland this past July 4th weekend. We also knew we were going to be lucky enough to be guests on the lovely boat Duet, owned by our friends Steve and Leslie. Looking forward to our time on the waters of Chesapeake Bay, we started searching out some lighthouses. Of course, knowing that SoccerFanatics hails from the East Coast, we thought we might get to find at least one of his 479 traditional caches! We were not to be disappointed and of course learned a lot by finding Sandy Point Shoal Lighthouse! Check out TCCPD to learn more historical information on this lighthouse built in 1883. We got a great photo of the lighthouse from the water (thanks to Steve for circling a few times). Pictured behind the lighthouse is the Chesapeake Bay Bridge, a major dual-span bridge. The original span opened in 1952 with a length of 4.3 miles and was the world's longest continuous over-water steel structure; the parallel span was added in 1973. The second picture of the lighthouse was taken at Sandy Point State Park, which is where we got the Confirmation Code to log the cache. We were excited to see the Junior Fleet Sailors from the Annapolis Yacht Club as they were learning to sail in the local summer program. Pictured are the quaint little sailboats that provide young sailors the skills and behaviors that will serve them to be successful on and off the water. Follow that up with the awesome sighting of the Yard Patrol craft at the U.S. Naval Academy. These boats are used for training and research purposes. They provide realistic, at-sea training in navigation and seamanship for midshipmen at the Academy. Go Red, White, and Blue!!! As we headed back to dock the Duet, our last sighting for the day was an osprey nest atop a channel marker. I was hoping for a picture of the actual raptor, but alas I had to settle for only the nest. The osprey tolerates a wide variety of habitats, nesting in any location near a body of water providing an adequate food supply. I'd say this particular osprey does not go hungry! It was a most satisfactory day of TerraCaching in the great state of Maryland!" Locationless caches are a similar to traditional geocaches in that they are found in the great outdoors. However, it is more of a "scavenger" hunt as opposed to a "treasure" hunt. The goal of these caches is to find a specific object somewhere in the world. To log them, you then typically enter the coordinates of where you found the object. smithwitch123 was recently on the hunt for some Quirky Items to be found while searching for TerraCaches- go check out "Unusual Mailboxes" (LC76U), "You Got Mail!" (LCIO), and "Dead Letter Box?" (LC7TF). Sort by the "category" option to review all of the Quirky Items locationless caches. "I was pretty excited to hunt these Locationless Caches. I mean, how hard can it be to find unusual mailboxes? I've seen them a million times, right? Yep, it's always harder than you think it's going to be! I had to travel all the way from Houston, Texas to Annapolis, Maryland to find the first two caches, which have nearly the same requirements. As far as the last one goes, I'm not sure where the heck I'm going to find that one! By the way, it is somewhat embarrassing to stand around with a GPS and camera in front of someone's mailbox... but it's the price we pay to log these caches!" We are a growing group of innovative geocaching enthusiasts focused on creating quality outdoor experiences. Head out on adventures to find traditional, locationless, and cyber geocaches. Join us and explore the world around you! ©TERRACACHING. ALL RIGHTS RESERVED 2004-2019. Receive emails with cool ideas, inspiring stories, great reviews and TC store offers. Please enter your email address and we will send you information about how to reset your password.